Start saving money today with these genius Kohl’s Shopping Hacks. Never overspend ever again! Kohl’s does exclude certain brands from their sales. You can see that list here. We have affiliate relationships which means that we may earn a small referral commission at no additional cost to you if you shop using our links. Are you a fan of shopping at Kohl’s? I am sure you have noticed that Kohl’s runs constant promotions. There is no need to pay full price if you can be patient and use Kohl’s coupon codes. Here are 15 Kohl’s shopping hacks, strategies, and policies to help you to save the most money shopping online and in the store. I am not an advocate of using credit cards, but if you shop with a Kohl’s credit card, you can take advantage of extra promotions sent to you throughout the year. You can charge your purchases to take full advantage of the discounts, and then pay your bill right at the register with cash or a check to avoid any interest charges! When you pay at the register by cash or check, your payments will post to your account the same day. If you shop online with your Kohl’s credit card, discipline yourself to pay off the balance right away so you do not offset your savings with interest charges. All Kohl’s charge customers receive additional discounts 12 times a year. Kohl’s charge customers who spend over $600 a year become MVC’s (Most Valued Customers) and receive 6 additional offers. You can read the finer points here and determine if this makes sense for you. The next Kohl’s shopping hack is to go back to the store if your product goes on sale. Kohl’s has a 14-day price protection policy. If you bought the item on sale or at regular price and within two weeks (14 days) of the purchase date, the price of the item was further reduced from the final price you paid, you can get a price adjustment. You can get one adjustment per item, so if the price is reduced further after your price adjustment, you cannot get another one. You must have the original, dated sales receipt. Items bought on clearance markdown, Kohl’s Cares, or BOGO (buy one get one free offers) are not eligible for further price adjustments. The third hack is to pay attention to competitor’s prices. Kohl’s will match competitors’ prices at the time of purchase. Just bring a copy of the competitor’s ad with the current date on it to your nearest Kohl’s Department Store. (Make sure the ad includes a description of the item.) This applies to in-store prices and products only, not to Kohls.com pricing or products. This hack also works online. For online purchases, call 1-866-887-8884 and have the competitor’s information from their website. Don’t just use one coupon code when you shop Kohl’s online, use two. Yup! You can use 2 Kohl’s discount codes online at one time when shopping on a mobile device. At the time of posting, you can stack up to 4 Kohl’s discount codes when you are shopping from a computer which include one sitewide percentage off coupon, one free shipping code, Kohl’s Cash or dollar off/percentage off specific promotion by a department. When stacking discount codes, the dollar off coupon will be deducted first. Kohl’s percent-off discounts cannot be combined. To use multiple codes online, enter one Kohl’s coupon code at a time, and then click apply after each. You will see the current Kohl’s Discount Codes at the bottom of this post. The next Kohl’s shopping hack is to get a coupon just for signing up for their email newsletter. Sign up for Kohl’s emails and save an extra 15% on your next purchase. You’ll receive email updates about our biggest sales and clearance events, notice of exclusive free shipping offers, plus promo codes valid for online savings! Another shopping hack is only for people of a certain age, and it is a fantastic one. Kohl’s offers a senior citizen discount of 15% off every Wednesday for ages 60+. To take advantage of this special discount, you must bring their identification for age verification. The offer is available in-store only. See your local store for more details. Save money when you shop online by browsing the discounted items. In store, look for the yellow clearance stickers or look for Goldstar Clearance racks Kohl’s also has an online clearance center. Here is the link to view those items on clearance. Kohl’s – Gold Star Clearance Center. You can use Kohl’s Cash for your clearance purchases too! This is my favorite Kohl’s shopping hack – use Kohl’s cash every single time you shop, both online and in the sore. Yes, remember: Kohl’s Cash – can be used in stores and online – and this is how to do it. For every $50 you accumulate in purchases, Kohl’s will issue you a $10 “Kohl’s Cash” code or voucher that can be redeemed at a specific later date on a purchase. Online buyers receive their Kohl’s Cash via email, and in-store purchasers receive it at checkout. Try to combine your Kohl’s cash with a sale or an online Kohl’s coupon code. The Kohl’s Cash is usually valid starting the following week and often overlaps with the percent-off discounts for a few days. To use your Kohl’s cash online, go to Kohls.com and enter the 15 digit coupon number and 4 digit PIN number when you checkout and the value of your Kohl’s Cash will come off your order. When redeeming online, there is a limit of 4 Kohl’s Cash codes per order. If you have expired Kohl’s cash, bring it to a store. My smart readers have told me that stores will honor expired Kohl’s cash for 10 days but you cannot use it online. Sign up for Yes2You Rewards (free to join) and you will get 8 savings offers throughout the year plus a gift on your birthday. Yes2You Rewards are issued once a month. You can save your Kohl’s Cash and your Yes2You Rewards in the app. You can also save coupons and have access to a barcode scanner you can use in stores. You will get 10 Yes2You Rewards for downloading the App. Connect to the Kohl’s guest Wi-Fi when you are in stores and you may score additional offers. Check for big markdowns on the 2nd and the 4th weekends during their Night Owl and Early Bird sales events. These sales are in store and online starting Friday at 2 PM online or 3 PM in stores and end on Saturdays at 3 PM online or 1 PM in stores. Another Kohl’s shopping hack is to look for special rebate or gift card with purchase offers. Typically found on small appliances, other kitchen items, luggage and more, check this section of the Kohl’s website to get current mail-in rebates on popular purchases. Orders placed from a Kohl’s Kiosk or from your Kohl’s app in store will ship for free. If an item is out of stock in-store, you can search inventory and locate the size and color you need online and you can use any discount codes that qualify. Use all of these Kohl’s shopping hacks and save money every single time you shop. 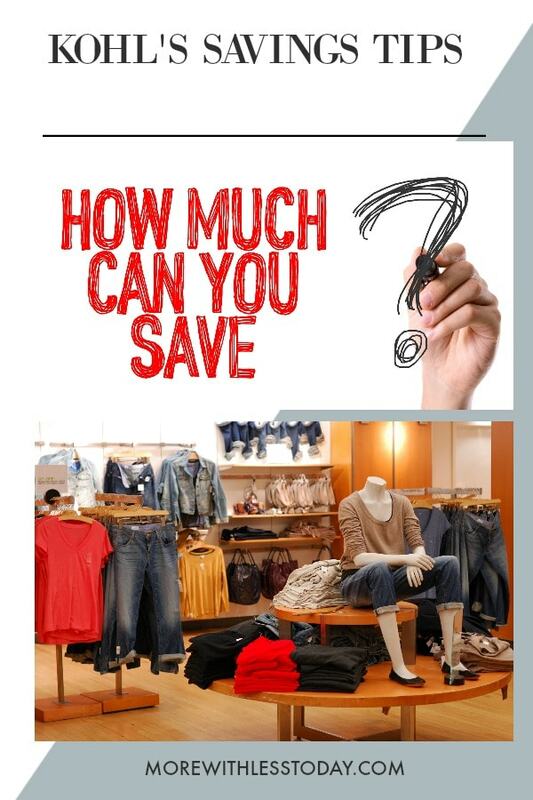 I’m a huge fan of Kohl’s Cash – it’s so fun to save them up and then watch the total go down when I use them to buy what I need. Don’t forget to pin this post and share it with your friends so they can learn how to save money at Kohl’s too. If you are having a baby or getting married, create a gift registry at Kohl’s to enjoy savings and special promotions.